The first seasonal matter is of course to wish members a happy Christmas and all the best for 2008. I have also just realised that it is 10 years since Phil Munson did his last newsletter and I started in March 1998 – terrifying ! 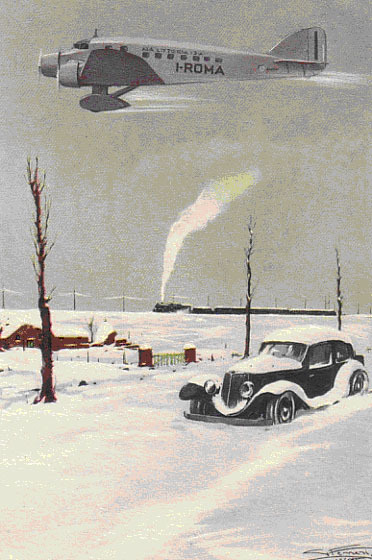 The feature card is a piece of classic nostalgia, firstly for when December had some connection with snow, even in Italy and again for the age when all forms of transport were seen as the height of progress. This Ala Littoria card from 1935 by artist Boeri celebrated the modernity of Mussolini s Italy with a Savoia S.71. There is no other connection with the contents of this issue other than that, with the ending of Colin Cohen’s series the title of “Most Frequent Contributor” passes to Leonardo Pinzauti. Leonardo will not take a regular slot but this month features the popular card topic of the Channel car air ferries. Colin’s old back page slot in the print version will now be used for Worth a Second Glance which has wandered about a bit lately to fit in with larger articles. This will be academic for on-line only members who had their big format change last time. In the absence of any comments I assume the new format is certainly acceptable or even an improvement. Elsewhere in this issue are some updates on catalogues and some new items which merit the question “What Do You Know ?” We also welcome a contribution on the Boeing 707 from US member Bill Demarest – Bill himself produced catalogues of the 707 and 747SP some time back and is currently the editor of the airline collectables magazine Captains Log. He will also be the organiser of the 2009 Airliners International Collectors Show to be held in Orlando, Florida. Finally there is part 1 of a review of Prestwick Airport cards – the B&W and sepia years. Some of these are such fine examples that I have used the extra needed for the subscription form to give them more space. Its worth noting that the postcard collector magazine Picture Postcard Monthly frequently has aviation articles covering areas perhaps under-represented by us. The December one features Luftwaffe propaganda cards. And pioneer Andre Beaumont at Carlisle.